McQueen always tried to push his stunt work to the edge of his ability for realism in his films. He did ride out of the chute for the saddle-bronc sequence, but let a stunt man finish the ride and get bucked off. Just before McQueen rode out of the chute on the bronc, he mistakenly goosed the stunt horse with his spurs, which resulted in an unscripted scene between the star and the horse that is included in the final cut, adding a true moment of realism and spontaneity in the rodeo action. In the early 1970s, Hollywood filmmakers were leaving the studio back lots of Los Angeles with fresh screenplays in hand, actors under contract and movie crews in tow into America’s urban landscapes, rural backcountry and the small towns of the heartland. They were seeking a realism that could not be recreated on a soundstage, the light, sounds and physicality of the locations, and most important, the real people and places that had inspired the screenwriter’s words. 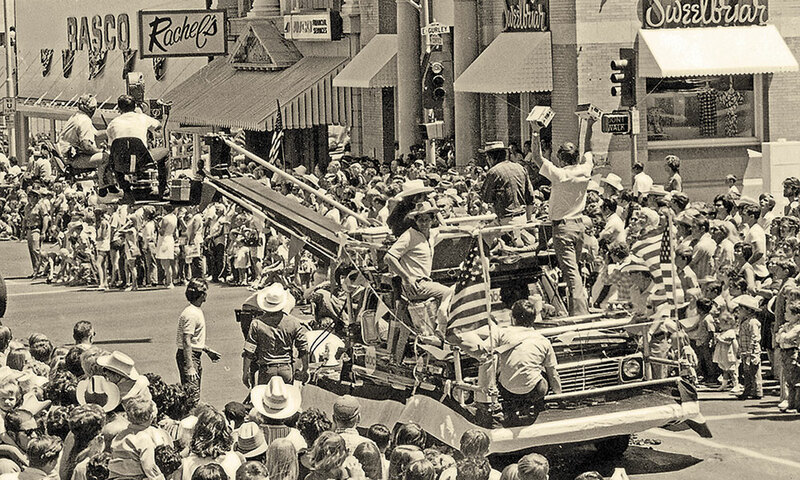 The crowds gathered along the streets of Prescott in 1971 to view the Frontier Days Fourth of July Parade had no idea that they would be part of history and a cast of thousands as Junior Bonner was filmed in real time. Over Labor Day weekend in September 1970, my father Jeb Rosebrook received a call from his agent Mike Wise. “Robert Redford wants a rodeo story. Do you have one?” Wise asked. Little did he know that my dad had just written a first draft of a story, “Bonner,” about an aging rodeo star whose career, family and hometown are all on the line. His agent also didn’t know that the highly personal story about my father’s adopted hometown, written after a short visit back to Prescott for the rodeo and the Fourth of July, would change the fates of so many, so quickly—especially our family. My father, who first came to Prescott as a 9-year-old boarding student to attend the nearby Orme School in early 1945, had not been to Prescott since 1955, and the changes he witnessed driving into the historic Yavapai County seat from Cordes Junction through Mayer, Humboldt, Dewey and Prescott Valley made a strong impression on him, especially the development of the wide-open spaces of the Fain Ranch. The “Bonner” story and the Junior Bonner screenplay that developed under the tutelage of producer Joe Wizan reflected my father’s love of Prescott and Yavapai County, its history, culture and people. A novelist before turning to screenwriting, he imbued his scripts with rich detail, lean, warm dialogue and history. Always history. And his words inspired Wizan to take the script to actor Steve McQueen and director Sam Peckinpah, both of whom signed up to participate in the production almost immediately. And they all wanted to make the movie in Prescott and Yavapai County. 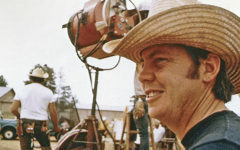 The reasons were many and personal why McQueen and Peckinpah wanted to leave the confining nature of film production in Hollywood, but most important, they wanted to produce the film on location in Arizona in the real-time of Prescott’s Frontier Days Parade and the World’s Oldest Rodeo. And in the summer of 1971, Peckinpah, McQueen and Rosebrook—disparate individuals united in purpose on location by producer Wizan—came to Prescott and left with a piece of history on film. 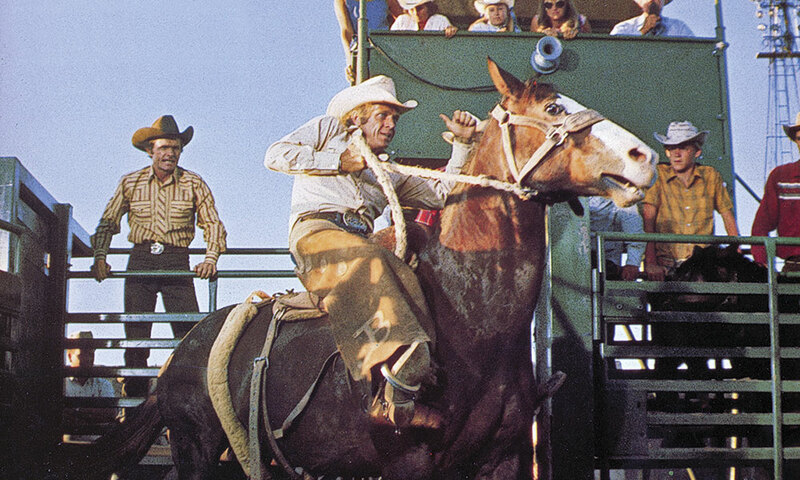 Junior Bonner was not the only rodeo picture of 1972 (Redford’s call for a rodeo story was definitely influential across Hollywood), but it can be argued that it is the greatest rodeo movie ever made in Arizona, about Arizona and Arizonans. Underneath—like the film—it is a deeply personal homage to family, historic Prescott and the small towns and ranchlands of Yavapai County. One reason the film was successful—and remains such a snapshot in time and history—was its location manager, the local Arizona Film Commission representative, president of the Fair Association and the Prescott Jaycees Rodeo Chairman, William Pierce. The local businessman was well-connected, friend to all and was not intimidated by Peckinpah or overly in awe of McQueen (he drove the star around on his motorcycle to get to locations during the parade sequence). Pierce recognized the locations my dad wrote about in the script and he was able to open all the doors to secure all the film’s locations. Pierce’s contribution to making the film a reality were so appreciated by the production company that the film ends with a heartfelt message of special thanks to Pierce. Fourth of July parades, as we all know, are very much a part of our national pride and fabric. Prescott and its iconic, historic town plaza are sewn into that fabric. As five cameras rolled, bands marched and played, clowns and Shriners paraded, the legendary Bill Williams Mountain Men rode horseback, Grand Marshall Casey Tibbs doffed his hat (showing no effects of his horse fall), and more bands played. There were the Orme campers, and young campers from nearby Friendly Pines Camp in a horse-driven stagecoach and, sure, enough, there came Curly Bonner’s real estate Reata Rancheros float, with hot pants “Dudettes” riding in back, watched over by Curly’s wife, Ruth (Mary Murphy), and Joe Don offering the crowd the gifts of hard candy. 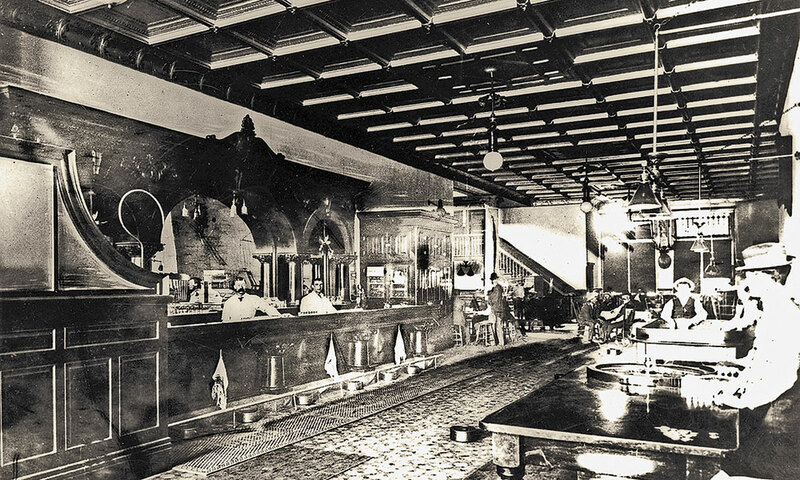 With a notorious heritage as a gambler’s den and cowboy watering hole, Prescott’s Palace Bar, the oldest operating saloon in Arizona, was a featured location in Rosebrook’s Junior Bonner. The Palace Bar, known today as the Palace Restaurant and Saloon, has been a central gathering place on Montezuma Street, aka Whiskey Row, across from the Yavapai County Courthouse and Plaza since it first opened as the Cabinet Saloon in 1874. Two changes: we simply have our rodeo announcer tell the crowd they will take a break, similar to halftime in football, go down to the Palace, where we will have the truly all-hell-breaking-loose fight, then return to the rodeo for the final afternoon events, the last of which is Junior and Sunshine. I wonder how rodeo purists will handle such a move. In my mind, there had never been a professional rodeo where the audience took a break, went off to drink and dance, then return to the remainder of the rodeo—all in one afternoon! Bottom line: to stay on budget, this is the way it will be done. In addition to an open bar, Peckinpah’s dance and bar fight sequences in the Palace Bar were primed with the live music of the Palace’s house band, led by Bob Cox with Rod Hart (credited songwriter and vocalist of “Rodeo Man” and “Arizona Morning”). 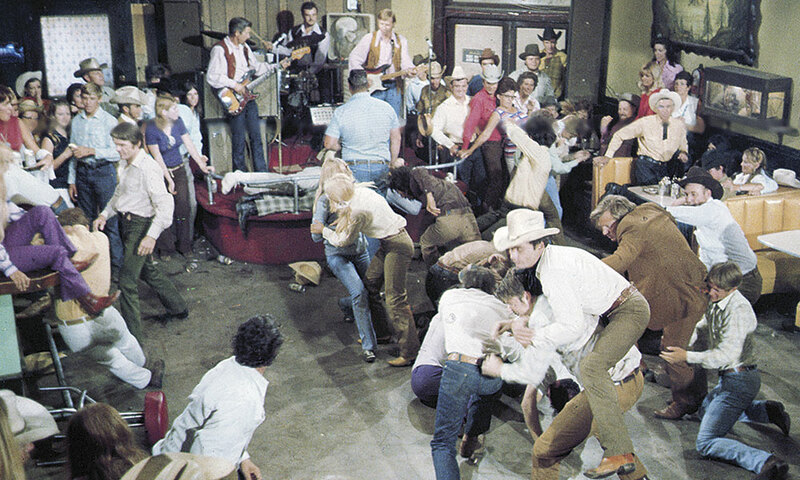 The dance and fight scenes included Peckinpah (in a cameo), cast members, crew members (including screenwriter Rosebrook, whose tennis shoes and white pants can be seen sticking out from the bandstand) and local extras. While the World’s Oldest Rodeo had its first competition in Prescott in 1888, the Yavapai County Fairgrounds featured in Junior Bonner was not built until the Works Progress Administration and the Civilian Conservation Corps funded and built it in the 1930s. Luckily for the production team, the location manager, Bill Pierce, was also the Prescott Jaycees rodeo chairman and the local Arizona Film Commission representative. The film crew had access to the arena throughout the rodeo and when the horses were not running at Prescott Downs. In my original screenplay, working with Joe Wizan, the initial scene did not introduce Junior but his father, Ace, and his dog, Dougal, as bulldozers move in to demolish the old Bonner homestead. So now an angry, if not terrifying, Brahma bull will open Junior Bonner. 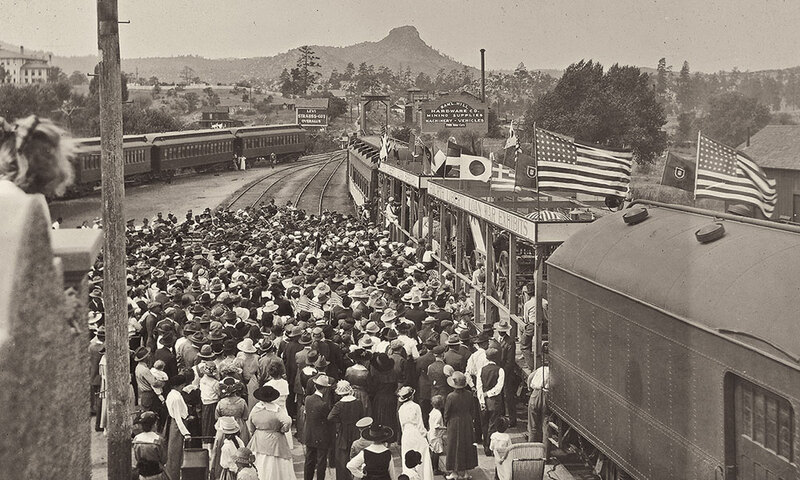 Beginning in 1883, the Santa Fe, Phoenix and Prescott Railway connected the Yavapai County Seat of Prescott to the nation and the world. Screenwriter Jeb Rosebrook’s nostalgia about his travels to and from the station in the 1940s and 1950s led him to feature it in his Junior Bonner screenplay. The Santa Fe, Phoenix and Prescott Railway began operating between Ash Fork and Prescott in 1893. When my father first came to Arizona with his mother Jean in February 1945 they arrived on the Super Chief and were met in Ash Fork by Charles H. Orme Sr. The scene at Prescott’s train station, between father and son, Ace and Junior, Robert Preston and Steve McQueen, is considered one of the finest moments—and most personal—for all involved. Somehow that scene arrived in my mind: the Prescott train depot. I knew Prescott’s Santa Fe, Prescott & Phoenix Railway depot from my many years attending Orme School in the late 1940s. I would be driven to Prescott to board the Santa Fe Railway’s “Peavine” passenger train service that operated from Phoenix’s Union Station to Ash Fork, where I would connect with the cross-country Santa Fe passenger train back home to New York or Virginia, depending on whether it was winter or summer. The depot scene will take place after the annual rodeo parade in which Junior and Ace have ridden and participated. Being turned down by Curly, Ace, thinking that Junior is far more successful in rodeo these days than he is, seeks him out to partner with him and bankroll his dream of Australia. The result: Ace learns that Junior is broke. No way can Junior pay his dad’s way to the Down Under country. Not even a down payment: “Broke, flatter than a tire,” Junior says. Dramatically and emotionally, Junior and Ace prepare for the third act. 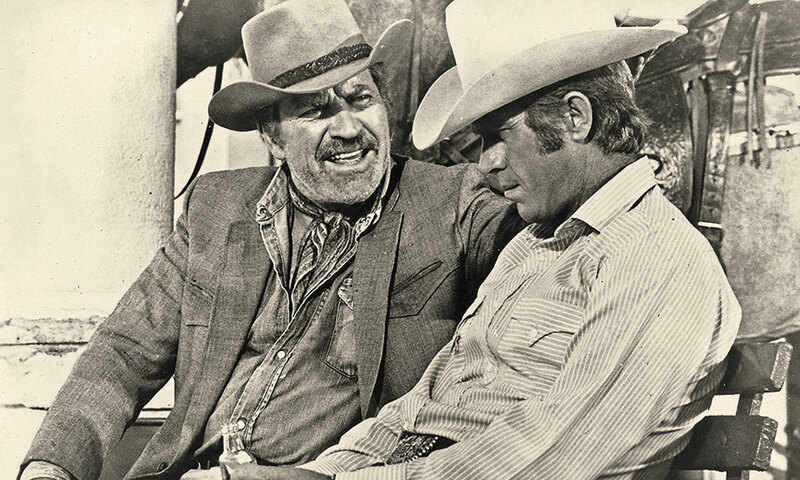 The emotional scene with Robert Preston and Steve McQueen is held dear by many who commiserate with the father-son relationship between Ace and Junior. The scene was very personal for screenwriter Rosebrook, as it was for Sam and Steve, who even shed a tear during the action, a moment of vulnerability rarely shown by McQueen on screen. Most of my father’s school years from 1945 to 1953 were at the Orme School on the Quarter Circle V Bar Ranch, set along Ash Creek in the rolling grasslands and high mesa country 35 miles east of Prescott. His daily life was equally divided between school, sports and ranch chores. Nature and the high desert were ever present in his life and going to town meant 90 miles of dirt road to Phoenix, Saturday night dances in Mayer and Humboldt and town trips in the back of stake bed trucks to Prescott. In Junior Bonner, the film takes McQueen’s character all over the county from Mayer to Prescott and Prescott to Jerome on Highways 69, 89 and 89A, highways that always led my father—and his character Junior—home. Tomorrow we were all leaving Prescott. When Steve McQueen signed on to star in Junior Bonner in 1971, he was the highest-paid movie star in the world—a position he rocketed to in a very short time considering the competition and era of filmmaking. McQueen’s first role in a Western was as supporting actor in Goodyear Playhouse’s 1955 episode “The Chivington Raid”, but it was not until a lucky break as a guest star on an episode of Robert Culp’s CBS series Trackdown in the spring of 1958 that his career took off. Soon, McQueen was starring himself on CBS as Josh Randall—in the spin-off series Wanted: Dead or Alive—and his career as the king of Western cool was launched. When McQueen died prematurely at the age of 50 in 1980, the star of Junior Bonner (ABC, 1972) left a limited, but succinct legacy of classic and modern Western films and television that defined and redefined the genre in McQueen’s inimitable style of cool. 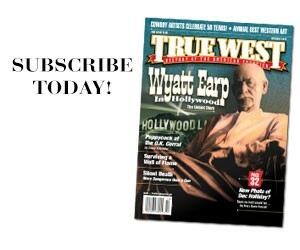 Author’s Note: Jeb Rosebrook and True West’s senior editor Stuart Rosebrook, father and son, first started writing together in the late 1980s when Stuart worked for his father’s production company, Falrose, and his partner, Joe Byrne. They were still writing together until his dad’s passing last year. 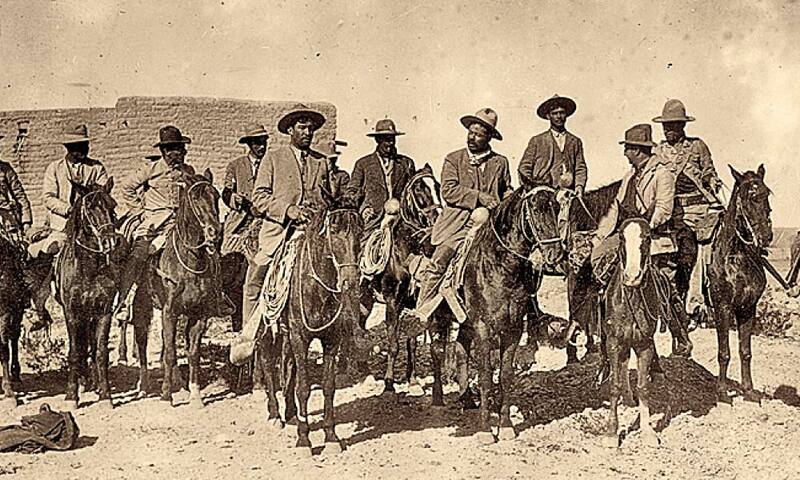 Pancho’s Lost Film We finally have a glimpse of Raoul Walsh’s 1914 movie. Where Cowboy Hats Rule! In the West’s most Western towns, cowboy hats—for men and women—still rule the day. Remembering Jeb Rosebrook A final interview reveals personal insights into the late award-winning screenwriter-author’s Hollywood career, his memoir and the making of his original screenplay into a classic film.